This light and spacious second floor 3 bedroom apartment is ideal for large families or groups. 1.4 km from Cascais centre, the apartment is within a minutes walk to a large supermarket, bus stop and pharmacy. Lisbon is only 30 minutes by train. FREE WiFi available throughout. Longer winter lets with attractive rates are available. Please inquire. 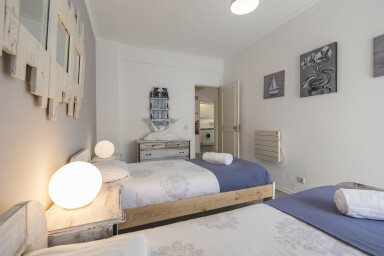 The apartment includes everything you need to make your Cascais stay a relaxing and memorable experience. Winter heating is available at no extra cost for the winter season. Locally and within a few minutes walk from the apartment there are a wide range of restaurants including, large local supermarket, local butcher and bank withdrawal facilities. The Sandy Bay is located 4km from the Cascais Hipodrome, 6 km from the Sintra-Cascais Natural Park and 13 km from Sintra. The local Cascais train station (1.4km) will take you directly to Lisbon centre in 30 minutes. Whether you enjoy horse riding, windsurfing, playing Golf, walking in the Sintra hills or simply relaxing on the beach we have all of these activities within a few minutes drive. We are also 28 km from Lisbon airport. Un fantástico apartamento con todo lo necesario. El propietario muy amable y atento. Ya es la segunda vez que repetimos en este apartamento y seguro que habrá una tercera vez.